1From the Dashboard, choose Settings→Reading. The Reading Settings page appears. 2In the Front Page Displays section, select the A Static Page radio button. This will display a drop-down list with different options. 3From the Front Page drop-down list, choose the static page that you want to serve as your front page. Here you will see different options for which page you want to serve as your front page. This is a good opportunity to choose a Welcome page or something similar. Don’t worry about the rest of the options on the Reading Settings page because they don’t pertain to configuring which page to use for the front page of your site. 4Click the Save Changes button at the bottom of page. 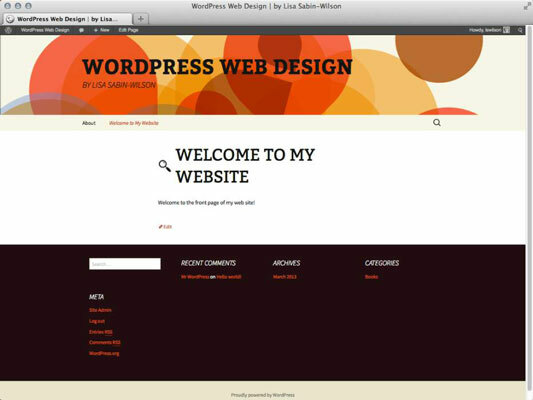 WordPress displays the page you selected in Step 3 as the front page of your site.